Create a killer title with this keyword helper! Are you struggling with coming up with unique, effective titles for your articles? 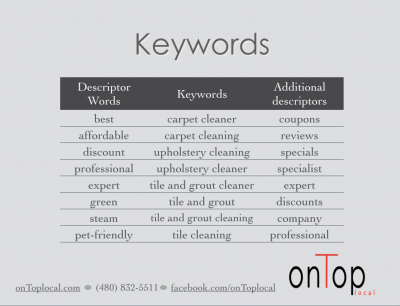 This chart will help you connect your keywords with effective descriptor words that you can mix and match for hundreds of title options. Look at the table above; as you can see, the keywords are always anchored in the middle of two descriptor words. But using different descriptors on either side of your keywords, you can come up with the perfect title for your articles. For instance, a good title might start with "Affordable Carpet Cleaning Expert." Don't forget to also add your city/state to the end of your keyword phrase in your title! Another good title option might be "Discount Tile and Grout Cleaner Coupons in Gilbert, AZ." What are some of the effective combinations you have come up with?